External auditory canal cholesteatoma (EACC) is an uncommon disease and its pathogenesis remains unclear. Clinically, patients usually present with symptoms like chronic dull pain and otorrhea, but many patients can be astonishingly silent or even asymptomatic. The intracranial complication with extensive mastoid cavity from primary EACC is extremely rare. Early diagnosis is imperative to facilitate best possible intervention and to relieve patient symptoms and to prevent further complications. 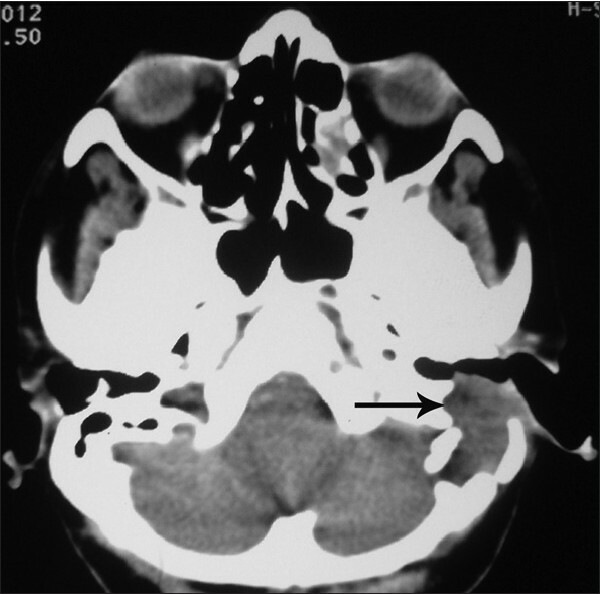 We present the first report in the English literature of a case of primary EACC presenting as cerebellar abscess. We experienced a rare case of a 55-year-old female patient admitted in our hospital with cerebellar abscess complicated by a cholesteatoma in the external auditory canal. The patient was first managed conservatively with systemic antibiotics by neurosurgeon, and then the disease was removed successfully by canal wall down mastoidectomy and no recurrence had occurred in the first 4 months post-operatively. External auditory canal cholesteatoma (EACC) is a rare disease with an estimated incidence of 1 in 1000 new otological patients. The disease is characterized by excessive accumulation of keratin material in the external auditory canal (EAC) as well as osteonecrosis with focal appearance of sequestrated bone lacking the epithelial covering. The etiopathology of the EACC remains uncertain. Clinically, symptoms like otorrhea with chronic dull pain are frequently reported, but many patients can be remarkably silent or even asymptomatic. , Hence, EACC may be a dangerous entity concealing serious destruction with few or no symptoms. Here, we present a rare case of primary EACC with extensive involvement of mastoid cavity and subsequently invading the posterior fossa dura and presenting as cerebellar abscess. The patient was first managed conservatively by neurosurgeon, and then the disease was removed successfully by canal wall down mastoidectomy. To the best of our knowledge, there has been no previously reported case in the English literature of EACC presenting with intracranial complication. We present this case with clinical and radiological finding along with management of such a case. A 55-year-old female admitted in the neurosurgery department with a history of intermittent fever and headache on left side for 1 month. On physical examination, patient was febrile, and in altered sensorium with Glassgow Coma Scale (E3 M6 V4). 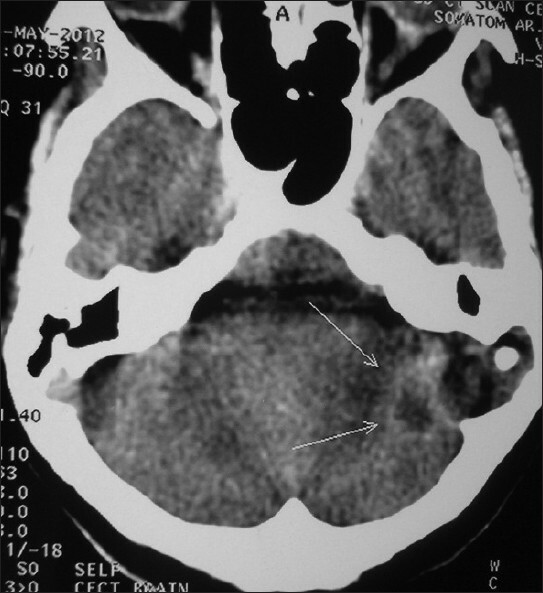 contrast enhanced computerized tomography (CECT) brain showed well-defined hypo dense space occupying lesion with irregular rim enhancement and perifocal edema of surrounding tissue, suggestive of abscess in left cerebellar hemisphere [Figure 1]. Imaging also revealed large soft-tissue mass eroding the posterior EAC wall [Figure 2]. The patient was managed conservatively with systemic antibiotics. ENT reference was sent to rule out otogenic cause for cerebellar abscess. Besides the above presenting complaints, patient also had history of otorrhea and otalgia in her left ear for 1 month along with vertigo and tinnitus, but did not complaint of hearing loss. No history of previous ear disease, significant trauma, or surgery was present. 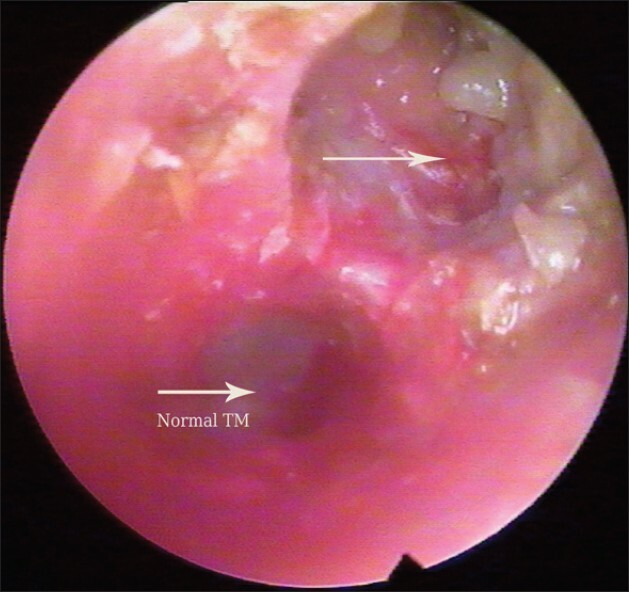 Otoendoscopic examination revealed erosion of posterior wall of left EAC with presence of keratin debris and with normal tympanic membrane [Figure 3]. Bilateral facial nerve was intact. 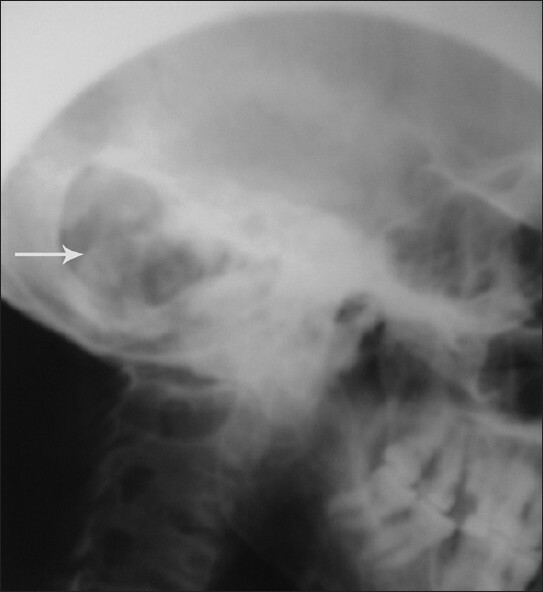 X-ray mastoid (schuller view) showed large lytic area in the mastoid region [Figure 4]. Pure tone audiogram was normal in both the ears. After clearance from neurosurgeon the patient was taken up for surgery. A post-auricular approach was used to expose the disease in the EAC. Large defect in the posterior wall of EAC with extensive invasion into the mastoid air cells by keratin debris was noted. The ear drum was intact. Modified radical mastoidectomy was done with preservation of tympanic membrane and ossicles. The eroded region was occupied by the squamous debris and a cholesteatoma sac which was removed carefully till posterior fossa dura was reached. Small breach in the dura was seen. The temporalis fascia graft was used to line the exposed dura. Post-operative period was event free and the cavity healed well. Patient was discharged on 14 th day of surgery. Patient has been on regular follow-up for 3 months with well healed cavity and free from presenting symptoms. EACC occurs more frequently among the elderly despite cases being reported in children and young adults. Clinically, patients with EACC usually presents with symptoms like chronic dull pain and otorrhea, but many patients can be amazingly silent or even asymptomatic. , Hearing loss is uncommon unless the cholesteatoma invades the middle ear or attic. In our case, the extension of the disease in the temporal bone is unusual. After eroding the posterior EAC and mastoid cavity, the disease had involved the posterior fossa dura, and presented as cerebellar abscess, without involving the middle ear, TMJ, and facial nerve. The intracranial complication with extensive mastoid cavity from primary EACC is extremely rare. Our case probably represents the first reported case of primary EACC with extensive mastoid involvement and presenting as cerebellar abscess. The most frequent pathway for EACC to spread to the brain is by means of cholesteatomatous bone erosion and formation of an extradural abscess. EACC may presents as an insidious entity concealing serious destruction with few or no symptoms. Endocranial abscess from primary EACC is extremely rare. Early diagnosis is paramount to enable optimal intervention and to relieve patient symptoms and prevent further complications. Aggressive surgical treatment is recommended when complications are present or imminent. With adequate surgical procedures, good outcomes can be achieved with good hearing. 1. Anthony PF, Anthony WP. Surgical treatment of external auditory canal cholesteatoma. Laryngoscope 1982;92:70-5. 2. Persaud RA, Hajioff D, Thevasagayam MS, Wareing MJ, Wright A. Keratosis obturans and external ear canal cholesteatoma: How and why we should distinguish between these conditions. Clin Otolaryngol Allied Sci 2004;29:577-81. 3. Holt JJ. Ear canal cholesteatoma. Laryngoscope 1992;102:608-13. 4. Vrabec JT, Chaljub G. External canal cholesteatoma. Am J Otol 2000;21:608-14. 5. Brookes GB, Graham MD. Post-traumatic cholesteatoma of the external auditory canal. Laryngoscope 1984;94:667-70. 6. Sismanis A, Huang CE, Abedi E, Williams GH. External ear canal cholesteatoma. Am J Otol 1986;7:126-9. 7. Piepergerdes MC, Kramer BM, Behnke EE. Keratosis obturans and external auditory canal cholesteatoma. Laryngoscope 1980;90:383-91. 8. Dubach P, Häusler R. External auditory canal cholesteatoma: Reassessment of and amendments to its categorization, pathogenesis, and treatment in 34 patients. Otol Neurotol 2008;29:941-8. 9. Cheng YF, Shiao AS, Lien CF. Pediatric external canal cholesteatoma with extensive invasion into the mastoid cavity. Int J Pediatr Otorhinolaryngol 2005;69:561-6. 10. Heilbrun ME, Salzman KL, Glastonbury CM, Harnsberger HR, Kennedy RJ, Shelton C. External auditory canal cholesteatoma: Clinical and imaging spectrum. AJNR Am J Neuroradiol 2003;24:751-6. 11. Martin DW, Selesnick SH, Parisier SC. External auditory canal cholesteatoma with erosion into the mastoid. Otolaryngol Head Neck Surg 1999;121:298-300. 12. Owen HH, Rosborg J, Gaihede M. Cholesteatoma of the external ear canal: Etiological factors, symptoms and clinical findings in a series of 48 cases. BMC Ear Nose Throat Disord 2006;6:16. 13. Naim R, Linthicum F Jr, Shen T, Bran G, Hormann K. Classification of the external auditory canal cholesteatoma. Laryngoscope 2005;115:455-60. 14. Darr EA, Linstrom CJ. Conservative management of advanced external auditory canal cholesteatoma. Otolaryngol Head Neck Surg 2010;142:278-80. 15. Zanini FD, Ameno ES, Magaldi SO, Lamar RA. Cholesteatoma of external auditory canal: A case report. Braz J Otorhinolaryngol 2005;71:91-3.